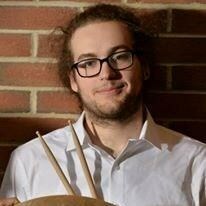 Asher Herzog is currently studying Jazz Percussion at Towson University with Frank Russo and Jonathan Seligman. He is an aspiring professional drummer with 12 years of musical experience, and 8 years of drum set experience, who has a familiarity with a multitude of drumming styles including Rock, Jazz, Marching Band, Classical Percussion, Modern Percussion repertoire, Free Improvisation, and Latin Percussion. Asher uses his strengths as a player, including his reading abilities in both standard pitched notation and drum tab notation as well as his strong improvisational abilities, to aid him in his teaching. This helps him to adapt as a teacher to the different learning styles of each of his students. Request Lessons with Asher today!